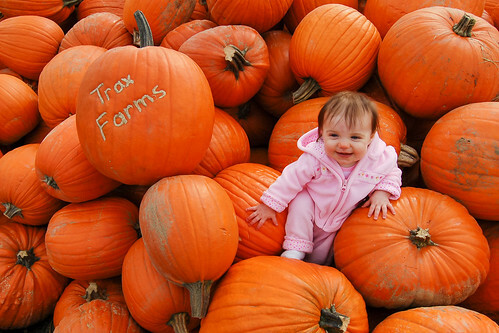 Evelyn took her first trip to Trax Farms today to pick out her pumpkin for Halloween. She had a few to choose from, and she climbed all over the pile to find the perfect one. 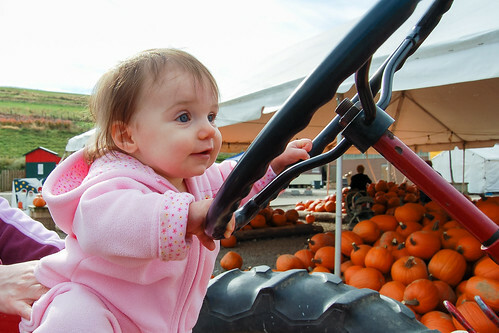 While she was there, Evy also had a chance to enjoy some of the other activities offered at the annual Fall Festival. She tried to drive the tractor around but could only reach the steering wheel and not the pedals. 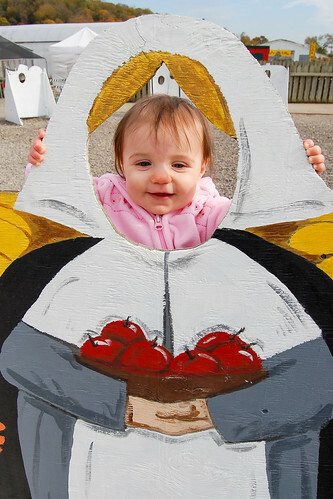 Then, we got to see what she would look like as a pilgrim. Until she pulled herself up on top of the cut-out and tried to bite it. We decided then that it was time to go. Overall we had a lot of fun, drank apple cider, picked out some nice pumpkins and took a few cute pictures. Sounds like the start of a family tradition. The pumpkins are bigger than Evelyn. It looks like she is a mountain climber in that big pumpkin stack. Tell her to keep her feet on the ground--she's too young to drive big farm equipment!